In honor of Thanksgiving tomorrow and the upcoming holiday season, I wanted to share with you a neat item I found on Etsy. 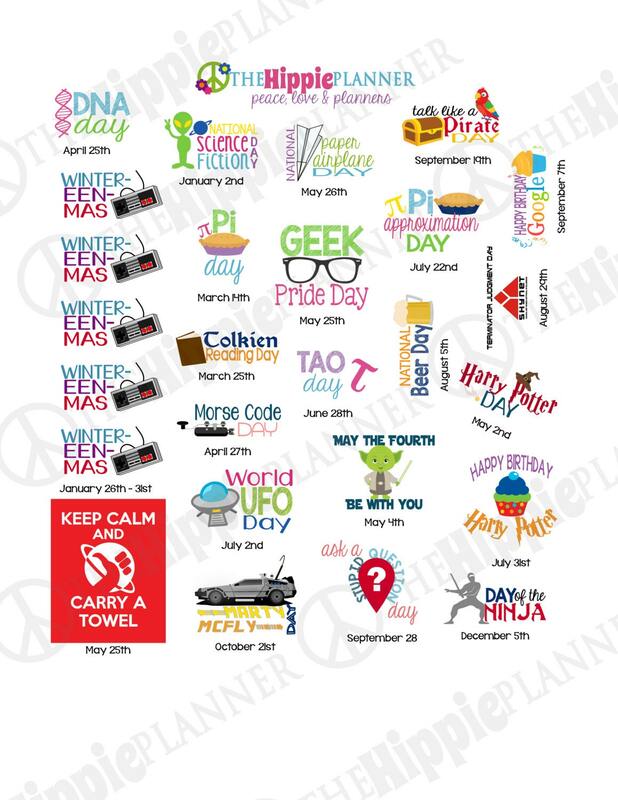 The Hippie Planner offers these really cool stickers that celebrate all of the best geeky holidays. These holidays may not all be widely celebrated yet, but it’s time we bring them mainstream! The sheet of 22 stickers lists several including Harry Potter Day, May The Fourth Be With You, Tolkien Reading Day, and National Science Fiction Day. If you are still on the fence about whether or not you need these in your life, let me tell you the kicker. Each sheet is only $7 (add $.50 for glossy) and the owner of the shop is even offering FREE SHIPPING for orders over $20! So if you want to add these to your next Etsy order, click here to buy. What do you think of these stickers? What geeky holidays will you celebrate? Let me know in the comments! This entry was posted in Dani, Geek Chic, Uncategorized and tagged Dani, Geek Chic, holiday stickers. Bookmark the permalink.